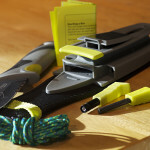 During any backpacking trip, a reliable multi-tool is crucial to basic responsibilities like chopping food to more complex duties like gear repair and equipment improvisation. The Leatherman Signal multi-tool by Leatherman offers a versatile swath of tools to accomplish it all in the backcountry. 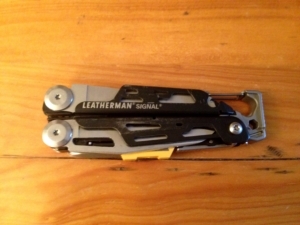 I tested the Leatherman Signal Multi-Tool during a 15-day backpacking trip in Glacier National Park, Montana. It was mainly used to cut and spread food, saw wood, and cut open bags, among other day to day uses. The other features of the Signal Multi-Tool were tested in the front country for strength and durability. The Leatherman Signal Multi-Tool features 19 different tools. These include needlenose and regular pliers, a saw, a wire stripper, a combo knife, a hammer, a carabiner, regular wire and hard-wire cutters, can and bottle openers, an awl with a thread loop, hex bit and regular bit drivers, two different sized box wrenches, a safety whistle, a fire starter rod, and a sharpener. The tools are made from 420HC stainless steel, which is a high-carbon form of 420 stainless steel. It is also coated in DLC (diamond like coating) that is applied for scratch and corrosion resistance. 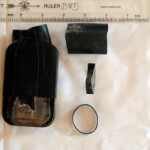 The closed length of the tool is 4.5 inches, and the main blade length is 2.73 inches. Its total weight is 7.5 ounces. For a newcomer to multi-tools, the Signal is not the most intuitive multi-tool. First of all, most first-time users will not need all 19 tools. Additionally, some of the tools, like the hammer and the two box wrenches are not instantly recognizable without the tool instruction sheet. Users with a lot of experience with multi-tools though will love the endless features. The pliers grip well and with a lot of strength, the saw was able to cut through a 2-inch diameter branch, and the knife needed no sharpening after 15 days of use (just in case, the Signal includes a diamond-coated sharpener, which my expedition partners used!). As a whole, the Signal is easy to open and lock closed, something I have often struggled to find in multi-tools. The Signal also can be disassembled using a small Torx wrench, meaning that parts can be replaced individually if they break. For a nearly $100 product, being able to replace easily one $10 part is a pro. 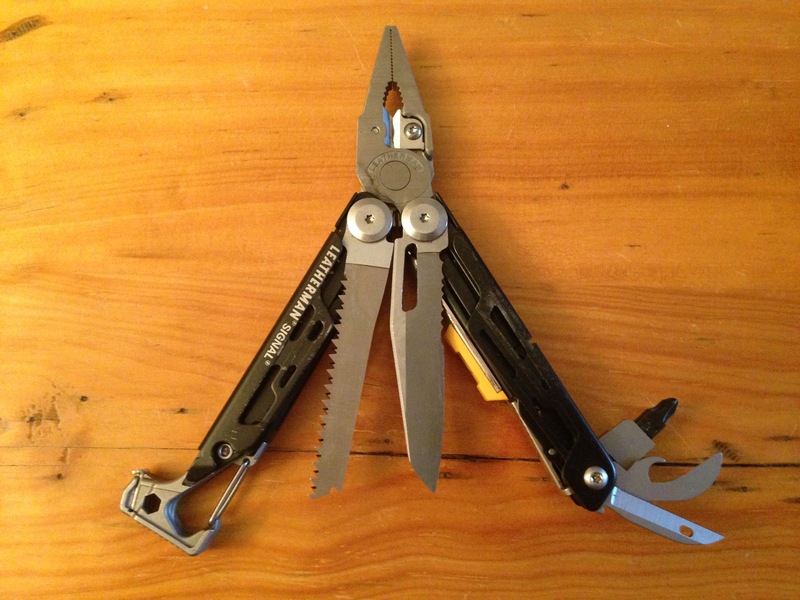 Compared to other Leatherman multi-tools with a similar number of tools, the Signal is on the lighter end. 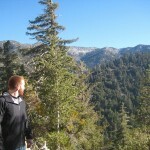 For lightweight backpackers, though, the Signal is very heavy. Many of the tools are useful and worth the weight, but others could be eliminated. For example, the Signal features a detachable whistle, yet whistles are found on the chest strap of most packs. 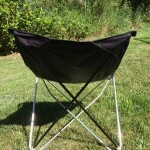 Overall, this is not a tool you bring on long backpacking trips where weight is a serious consideration. 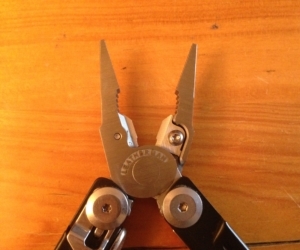 When purchasing the Leatherman Signal Multi-Tool, you are paying for a reliable tool from a respectable brand. For the outdoors person who enjoys fixing even the smallest defects on their gear, the Signal is a fun and effective multi-tool. Its features are strong, sharp, and durable. For people looking for a simple multi-tool with basic functions, the weight and number of tools are extraneous compared to other, simpler multi-tools.